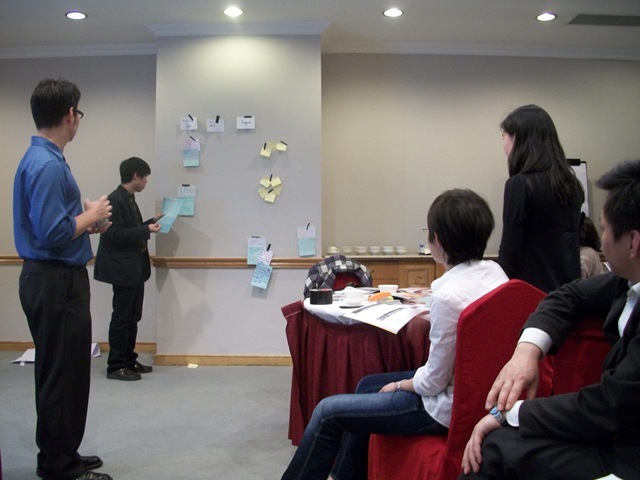 After the Shanghai Scrum Gathering 2010, I went to Chengdu helpping Outsofting on CSM training by Kane Mar. 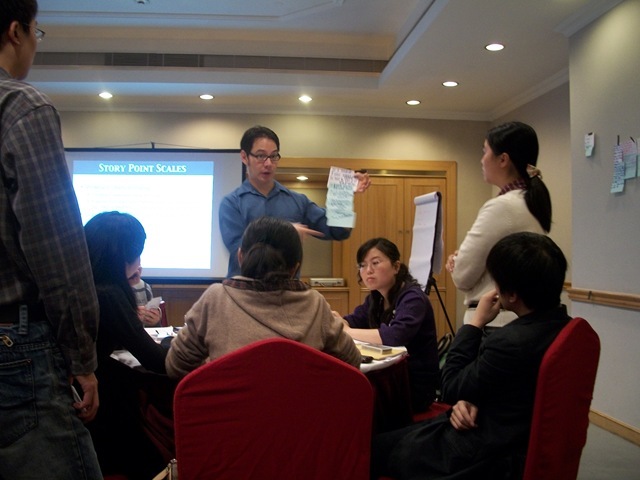 Kane is a Certified Scrum Trainer, he argued combining Scrum and XP with Ken Schwaber at 2001, you can find more information about him via his website, and here is his introduction in Chinese at Outsofting website. Personally I found his cartoon figure very interesting, here it it : . 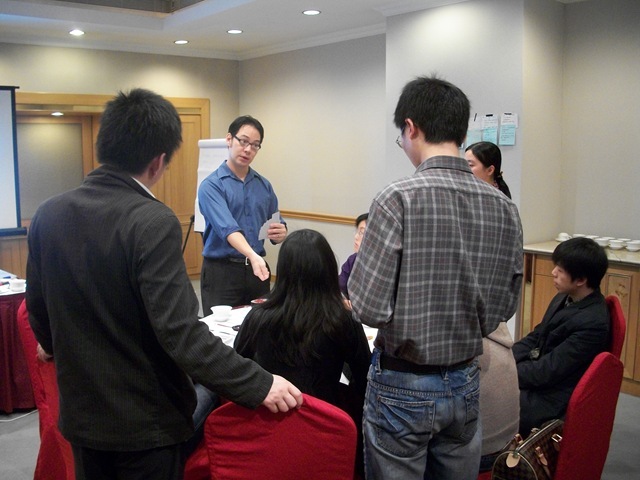 I’m used to Bas Vodde or Lv Yi’s style in giving CSM training, and I experienced once Michael James’ which was so different style (I actually blogged it : CSM Training By Michael James), Kane’s is similar to Michael but different. Before the training we did a little bit set-up work : removing the stupid rostrum and put to the corner in the room, cause we don’t need that, it will block the connection between trainer and trainees. And we reorganized the tables, to keep them in a distance that neither too close to the projector screen nor too far away from the trainer. 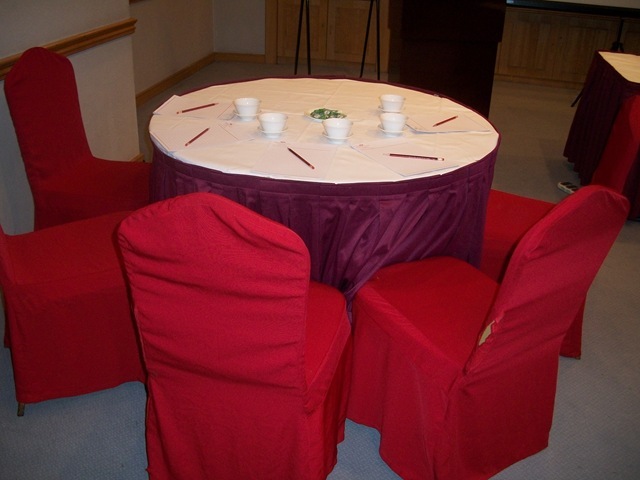 Every table could fit for 5~6 people which is a great size for training, in my opinion. Kane was more in an interactive style, and insert all the contents into interactions, and interestingly kind of all contents were covered. You should know that many times CSM received the same comment, “too many contents in only 2 days”. And I’m sure that people learned a lot from this 2 days’ journey since they discussed a lot, and so many questions popped up during it. Questions were answered on the fly, sometimes even by themselves, e.g. 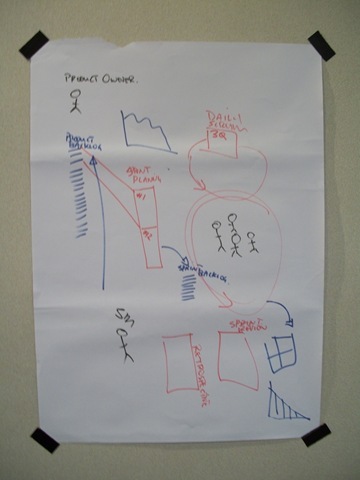 one participant answered question of TDD and CI very well that I only need to add a few more explainations. Therefore we didn’t have anything on the “Parking Lot” flipchart paper. As any trainers (I guess it’s common), Kane asked some starting questions to uncover hidden background information. 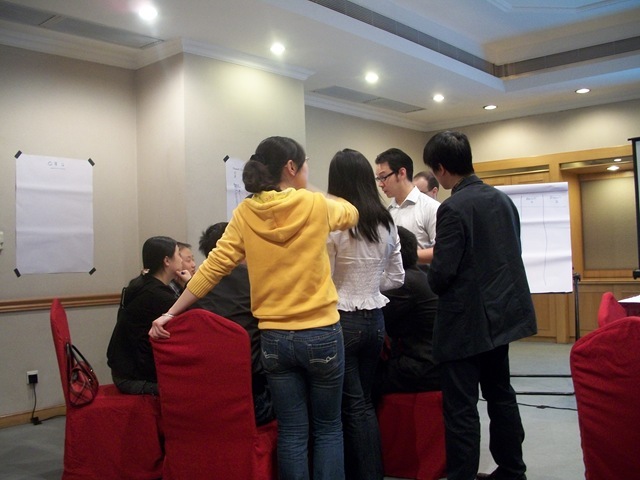 He didn’t directly move into the course after openning, but used “The Web Portal” story, led people discuss the problems and potential solutions, then got to the point of training with people curious. Kane had a different training procedure as the ones I experienced or mentally designed, and I like his. 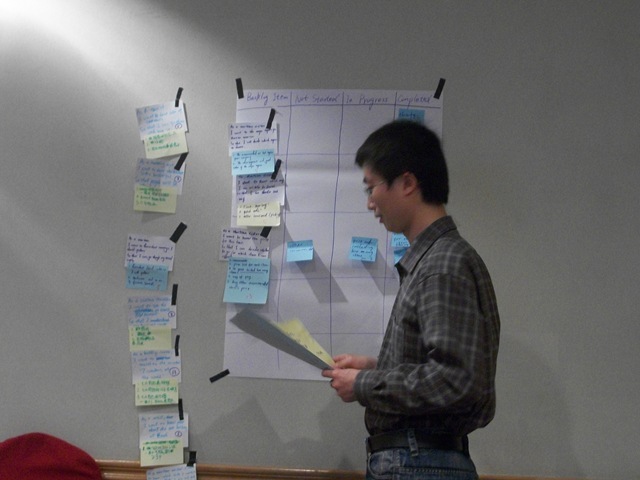 He spended very short time in introducing “What is Scrum?”, and the reason is Scrum framework itself is very very simple, the most difficult part is adopting it and adjusting. 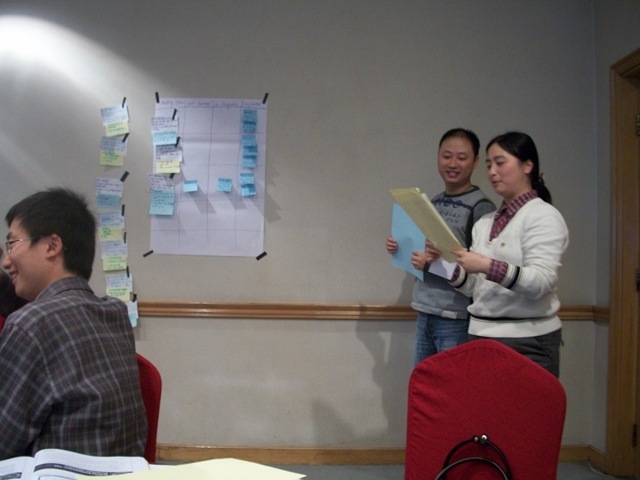 The the rest of 2 days training was leading them through the Scrum Adoptation journey. After explained Product Backlog in details, and showed some examples, plus discussed the differences between task and user story. 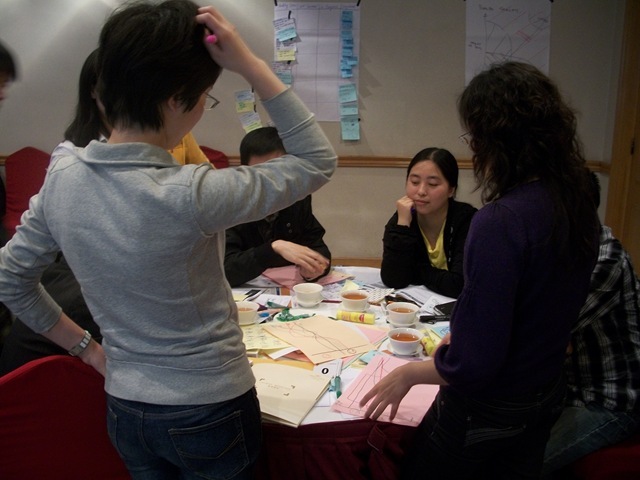 We asked the trainees to setup Scrum teams, each table will have a Product Owner and team members. 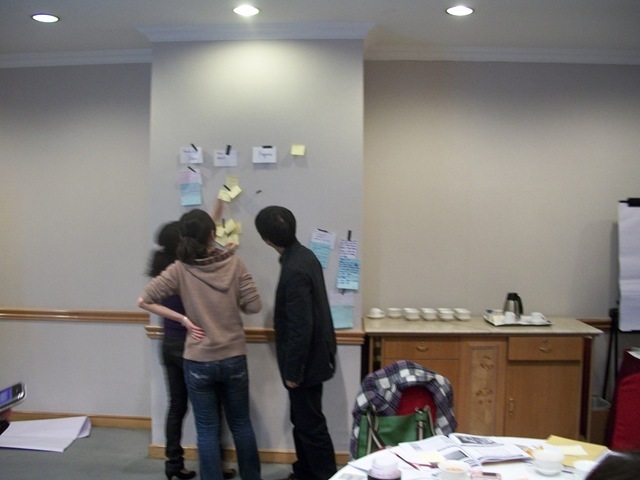 And their work was to developing out an initial Product Backlog, brochure exercise was used. 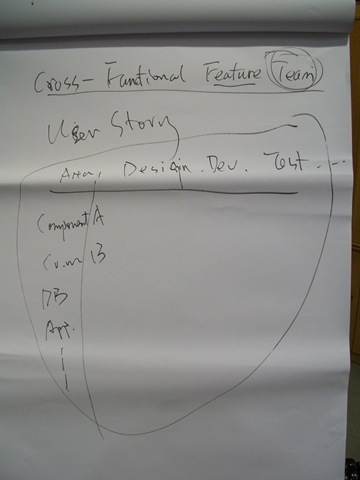 Teams had to choose one product, and pick at least 5 requirements from that, write into User Story format. 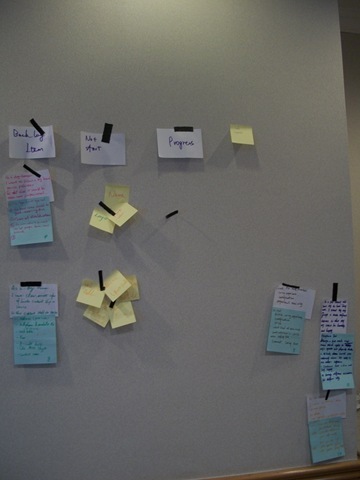 Introduced the INVEST principle, and required their user stories to be uniformed with it. After that, it’s the explaination of Agile Estimating, Kane prefers T-shirt size, while I like more the Fibonacci numbers. 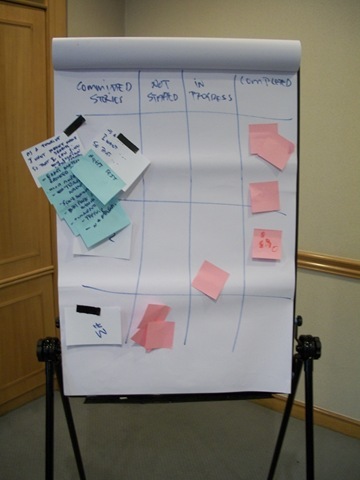 At the same time, Product Owners need to prioritize those user stories based on a mixed priority measure. Kane’s CSM seems like a huge 59-mins Scrum simulation game. He encapsulated the course into 2 sprints simulation, with all necessary pieces of knowledge illustrated when corresponding questions appear. He also like to ask invoking or thinking questions, which encourages the participants to think and figure out solutions by themselves. The 1st day ended up with Sprint Review and Sprint Retrospective. During this day, Product Owner still have work to do, adding more user stories, getting estimation from team by Backlog Refinement session, and prioritize the latest Product Backlog. I didn’t remember well, it should be Julien Mazloum explaining the prioritization part. 2nd day was simple, finished the 2nd Sprint, then the rest of the training would use their own exercise data as examples. 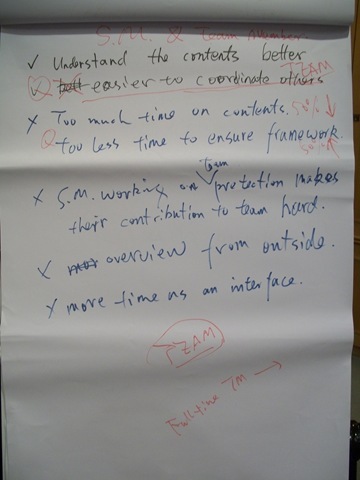 Two teams shared their retrospection results of last sprint, this triggered a fierce discussion too, which is very good. Introduced DONE since some user stories were rejected by Product Owner in last sprint. And also explained that sacrificing DONE will accumulate your Technical Debt which slows you down in the future. Therefore we went to Velocity. Very nice that Kane indicated the harm of comparing velocity in his material, since so many organizations made this mistake and can’t get out there. Then we went through those roles and release planning, and scaling. Faint, my memory is so bad, I forgot what are those parts I took. However, “Scrum Master” and “Scaling” are definitely 2 parts of those. Kane encouraged me to give it in Chinese, and I normally allow people asking questions, and don’t like to interrupt discussion if people are still talking. Due to above reasons, I directed the session “Scrum Master” for kind of 1.5 hours, and I guess Kane planned to use 0.5 hours. Well, Kane said it’s fine, because I caused a lot of discussion from the participants due to Chinese language. But he cancelled the Ball Game… Scaling is always a hard topic, there are so many doubts, concerns that how could it works. Kane Mar’s write-up about this training. Julien’s trophy of taking photo. 1 Pings/Trackbacks for "CSM Training by Kane Mar (21~22 April 2010)"